Cargador Iphone Original Apple - Enchufe + Cable 1m. Control Joystick Bluetooth Celular Android Iphone Pc + Usb! 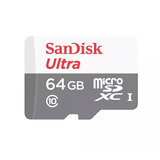 Memoria Micro Sd 64gb Sandisk Ultra Uhs-i Remate ! !